I love serendipity. It reinforces my belief in an invisible, physical interconnectedness permeating all things, made manifest only if you're still and quiet enough to notice it. It makes life seem a bit less scary, a bit more meaningful. Such was the case recently with Alana Chernila. I belong to several book buying clubs. 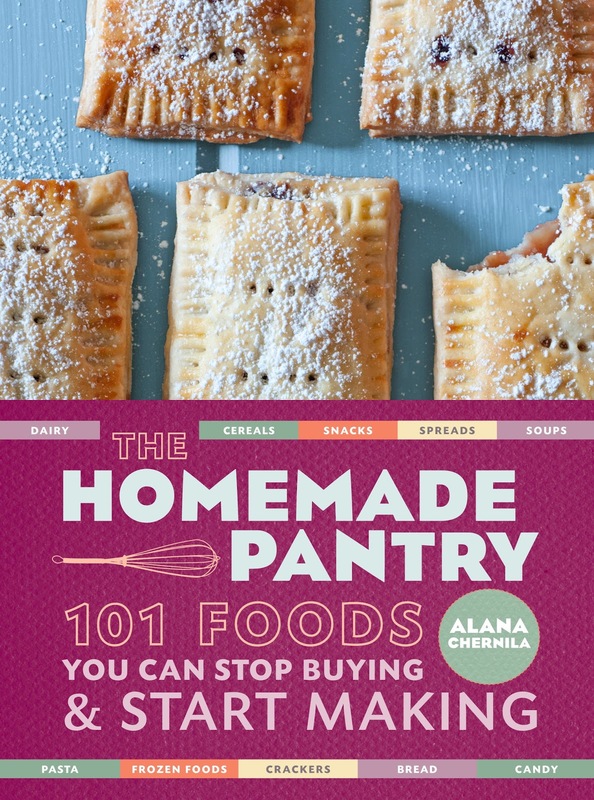 Her book, The Homemade Pantry: 101 Foods You Can Stop Buying & Start Making, just published April 3rd. My book club began promoting it a few weeks ago and it instantly caught my eye. I checked into Alana, pre-ordered the book, and began following her on Twitter. Later that day, she followed me back, with a sweet message saying I seemed like someone she'd love to cook with. And so, an alliance was formed and we've been chatting each other up since. This book. THIS. BOOK. Friends, you're going to love it. Literally running the pantry gamut from soup to nuts, Alana expertly shows you how to craft in your kitchen many items you're currently buying. Most of the projects don't involve a great deal of time or a long list of ingredients, either, so you really are saving in so many ways. The book is packed with recipes she feeds her own family, so you can trust each one to deliver. Not only is the book comprehensive in range, it's kitchen-friendly, too. The cover is meant to withstand repeated splatters and the pages (full of beautiful photography!) are meant to be dog-eared and turned to, again and again. I purchased my own copy and was so deeply smitten with it that I didn't want to give it away! I wrote Alana, detailing my plight to her. Her publisher, Potter, then generously offered to give a copy to one lucky small measure reader. To be entered in the giveaway, simply leave a comment below, listing one pantry staple you've long wished to conquer. For me, it's several (it's so hard to choose! ): sauerkraut, bread, and mayonnaise. In your reply, please leave a means of contacting you, should you be the winner, via either a link to your blog or website, or by listing your email address in your comment. I'll run the giveaway through next Wednesday, April 25th, midnight EST. Canadians, feel free to enter, too! In the meantime, check out Alana's blog, Eating From the Ground Up, as well as her food tutorial videos. She's a lovely lady, a creative cook, a nurturing mama, and a sweet soul. Thanks, serendipity, for hitching my wagon to hers! UPDATE: The winner of The Homemade Pantry is lucky #208, Amy! Thank you so very much to everyone who commented. I'm inspired by what everyone wants to learn to do! Ah-- I would love to win this book! I would really like to learn how to make a basic, everyday bread that holds up well for sandwiches and toast. I'd love to conquer ketchup! My email address is jbuckway123@yahoo.com. what a great book! i would love to win it!! like you said, there are so many things i would like to make... but bread is one thing that comes to mind as a staple of the house that i should be making much more consistently. my email is simoneperrin@gmail.com. thanks! Salsa! I can't seem to master the art of a really, really good salsa. What a wonderful book! Both my mom and I would both love this book! Top of my list of things to make instead of buy would be cheese! The curiosity is killing me! I can only imagine what delicious recipes are in this book...unless I win of course! I want to stop buying breakfast items: english muffins, cereal, bars! Sigh...I'd love to conquer bread! I dream of being able to make sandwich bread, ciabatta, baguettes. I'd also like to conquer the condiments and have a steady supply of ketchup, mustard and BBQ sauce on hand! Spicy mustard, my favorite. I need to make about a gallon of it just for myself. I would love to win! Saw this book on the Food in Jars site first and it looks awesome. I've always wanted to make my own sauerkraut, BBQ sauce and a really good spaghetti sauce. Those would be my favs to try. I would love to win this book! What an excellent idea for a book! I've been struggling to perfect a good baguette. I've got soft white bread down, and dinner rolls, but baguettes are still unconquerable! I would love this book! I would love to learn how to make my own every day, peanut butter and jelly kind of bread. I saw it the other day and really, really, wanted a copy to call my own. Alas, I was moving and couldn't really add one more book to the collection. Who knows, maybe serendipity will be on my side now, and bring me closer to all this pantry goodness? I would love this book- and love your blog! I'm excited about trying some recipes for homemade condiments: ketchup, mustard, etc. please, please, please! What a great idea for a book!! English muffins. I know they are not hard to make but I find I keep buying them and not making them. Not sure why that is. Well, I just learned to make cheese (!) last weekend, so I guess my next challenge is granola bars. Ohhhh! This is a GREAT giveaway! I'd love to never buy bread again. I really don't use much of it anyway...and when I buy it, the majority of the loaf goes stale before I can use it. I have been eyeing this book for a while now! I would love to conquer crackers that are easy and quick to make, yet still healthy and tasty. Ad cheese to go on them too! Sauerkraut for sure. Every year I say, "This is the LAST time I'm trying this!" Next thing you know, another cabbage season rolls around and I'm sayin' it again. Cheese and ketchup. In that order. Thanks for the great opportunity. Bread. So good and so frustrating all at the same time. This book looks awesome. I'd love to make my own ketchup, we go through SO much of it! Chewy chocolate chip granola bars! i would love to have this book. I have bread making down - even started my own sourdough culture - but I would like to try sauerkraut. I am just not sure if the south FL climate will allow it to ferment rather than rot! Bread and pasta I think. At least those are the top two. I can think of a lot more than that though! I think bread would have to be my top item but there are lots of staples I would rather make at home if I could! This book sounds great! What a fantastic giveaway! I think that canned tomatoes would be my first choice. I would love to have a summer where I grow enough to not buy any more cans...maybe this is the year! I would love to try fermenting something, like sauerkraut, but since I'm the only one in my family that likes things like that I'd have to eat it all myself! I would love this book! I'd like to learn how to make so many things. I'd say salad dressing and cereals would two key things I'd like to master. Nutella - a friend made some for my wife and I for Christmas, and while it was tasty, it wasn't very spreadable. My daughter Savanna has notoriously PICKY tastebuds and one of my biggest woes has been creating kid friendly foods for her that are homemade not processed. Add to that 2 teenage boys. I am sold by the picture of the pastries on the cover. My family would gobble those up in a heartbeat. I would love to be able to make snacks such as crackers as well as many other items. Please enter my name in the drawing. I have been enjoying your blog for a few months now, LOVE IT! I would adore this! I forgot to leave my email address in my previous comment-- it's giniandtonic@gmail.com. What a fascinating-looking book! That sounds like my type of book! I'd love to make more of my own "staple" foods. I'm still trying to make bagels. One day they will turn out... I hope! Saurkraut and sourdough bread. Those sour things get the best of me. I always make the kraut too salty and my sourdough NEVER rises. Such a great giveaway! Thanks! I would love to conquer cheese! I have tried mozzarella but it needs some more work for sure! Oh this looks so good! I'd love to try to pop-tarts on the cover! I've been eyeing this book too! Would love to win! i have finally conquered BREAD making but now poptarts would be awesome BC we love them ,love them lots. I am always up for an challenge and now that baby#2 is on the way baby food is the next challenge. Ooooo, I'm so excited about this book! I've started making granola at home and it's been awesome. I'd like to learn how to make healthy crackers and bread! Mayo and ketchup. I buy a lot of both! Well, I've got bread and yogurt down but I don't really have crackers, snacks or granola bars down yet. And always interesting things to can. I would love to conquer bread...also maybe jelly/jams and syrups! Oh my goodness...anything resembling honey nut cheerios...my kids LOVE them...and I hate packaged cereal! I'd love this book! I'm planning to try my hand at a few new things and this would be a great resource. I'd like to master both bread and mayonnaise. My daughter is allergic to soy and so many packaged products contain soy. The more things I can make from scratch the better! Oh my gosh, I just got to your blog from the Epicurious email today and I'm so excited to see everything you've written about. Definitely going to RSS your posts! OK, what would I like to tackle? Cheese. I have been nurturing lustful cheese dreams since my children were young and I ordered the Laura Ingalls Wilder cookbook to augment our reading. Now that I'm buying raw milk, having the super healthy cheese rather than offerings full of nasty stuff would be incredible. greek yogurt! we eat so much of it! this book looks really great, thanks for the giveaway! Pickles! I've made a couple batches, but am hoping to do many more. scott DOT conroy AT gmail DOT com. Oh my, this book looks fabulous!! Pinning it to my wishlist in case i don't win. I would practically kill to do an awesome homemade granola. For some reason, the concept of this completely eludes me every time I try. I have issues sometimes with my cibatta (which is my fiance's favorite bread) and I'd LOVE to make my own ketchup and mustards! OH MY GOSH!!!!!! It's like this book was tailor-made for ME! I have a whole list of things: homemade noodles, nutella, sauerkraut (still too salty!) bagels, doughnuts! This is DEFINITELY going to the top of my list. Count me in! Looks awesome. Bread! I'm working on it. Also condiments and beverages like kvass and kombucha so I have something good to drink once in a while besides water. This book looks so great! I would like to have homemade butter and fresh cheese at all times in my fridge! And those poptarts look pretty darn awesome, too! Like so many others, I would love to master bread and pasta. So far my attempts have not been successful. Would love to win this book! I just learned of The Homemade Pantry YESTERDAY from Heidi Swanson's 101 Cookbooks blog and ordered it right away! Bread, mustard, and cheese - all the fixins for a delicious homemade sandwich! How fun - that sounds right up my alley! I am determined to make ketchup this summer! This looks like an intriguing book. I am always looking for more homemade basics to add to the pantry. Fingers crossed for a winning number! Those breakfast pastries on the cover look like a good start to me! Crackers. Something that is neither chewy nor capable of cracking multiple teeth. Canned tomatoes are my fear! I'd like to be able to make my own crackers that stay crisp - but making anything I thought I had to buy is a great joy! Okay, I see poptarts on the cover and thought, yes! My kids would love for me to make these since I won't buy them for them! Ooh, what a great giveaway! I'd love to make my own mustard. Yogurt! Buttermilk! Mayonaise! Thank you! I want to make cheese, condiments and granola. I've long wanted to find a way to make granola that is clumpy and crunch like the one you find commercially made (as opposed to more of a woody/sawdust/burnt oats taste and texture). I've yet to hit on exactly the right recipe. I'd also love to find a ketchup recipe that doesn't take hours of work and that tastes more like commercial ketchup (most are way off on the spices and texture). Canadians feel free to enter. What about the rest of the world? Oh, how perfect - just what I need. There are so many things I want to master...or be inspired to go back to making. Bread, condiments, spice mixes, pasta - the list goes on and on. I'd love a copy of this book, if only to learn how to make a ketchup that the picky eaters of my family would eat. Pancakes. I am completely baffled - there are many complicated and exotic things that I've conquered, but I can only successfully make pancakes when using a mix. I would love to make my own sort of "add eggs and milk" dry pancake mix! :-) What pantry staple wouldn't I like to learn more about?? We've been working on doing more whole food cooking but are still learning all the things we can actually make ourselves - the chapter on cereals would be amazing! I want to make bread and spaghetti sauce and breakfast on the go items. And I'm sure the book is full of things I don't even know I want to make! I would love to read this book! I just fell into her lovely world last week when you suggested it in your Friday listings. Thank you! Amazing! I'd love to conquer bread. A real staple around here. I've tried many times and have never been satisfied. I guess I just need to practice my kneading. Ashley! You can totally do mayo! I just started two weeks back and I think the trick is to use a blender,or food processor, or maybe that sweet kitchenaid of yours. It's equally awesome to your fresh whipped cream or butter when you add it to sandwiches. (I mean, you will feel as awesome as when you make whipped cream) Good luck! I'd like to know how to make a good cracker, so my little one has good snack food where I know every one of the ingredients. Oh- for me it's pasta. I always think if I can make our crackers and bread, for sure I can make our pasta. This book is right up my alley and will for sure teach me something new that I've overlooked. THanks for the chance! I have always wanted to just shop "the peremitre" of the grocery store so this book would be perfect, off to check out her blog! This book looks *amazing*! Can't wait to see it in person. I would definitely like to learn to make better bread. For as much success as I've had in other areas, bread remains a mystery to me! Thank you! This looks awesome! I would love to conquer and feed all homemade items for Breakfast...bread, bagels, english muffins...yogurt! Hmm...ketchup, probably. Here's hoping for a bountiful tomato harvest this year. This book looks amazing! I've recently started making my own granola which was the first item on my "to make myself life." And my own ketchup has been delightful. I really want to go through the refrigerator and throw out all the condiments to force myself to make them all from scratch and only the ones we really want! Rawr! Want! I would love to make more things from scratch, but sometimes I just don't know what's worth the trouble and what's not. This book would be fantastic to win! This book sounds wonderful---I already read her blog and it is great. Thanks for the chance to enter. Great cover! I love to cook and bake so would enjoy this I am sure. Oh wow, this book sounds amazing. I've got a long list too! I've started making my own bread, but I've yet to try things like crackers, tortilla or pitas. I haven't touch dairy yet at all, but would love to start making cheese and yogurt. And I've love to start making my own candy too...marshmallows for a start, and then moving on from there. Thanks for the chance to win! I'd love to make a good sandwich bread and aioli. Bagels, english muffins, and refried black beans. Chewy granola bars (that my kids will actually eat)! So far I just can't beat Quaker. Sigh. Oh wow. I'd love a copy of this book! My choices: yogurt, mayonaise, and cheese. This book looks amazing. I want to make yogurt! Yummy! I want to learn to make good salad dressings that don't get all thick and waxy in the fridge from the olive oil. Also... alternatives to store bought cereal! I would love to conquer cheese. This book looks splendid. Oh I have been eyeing this book!! I am quite intimidated by anything fermented and would love to make my own sauerkraut! Ketchup is something I'd like to make myself. Great contest ! granola bars and cheese for sure! I chuckled when I read "sauerkraut" on your list, because this is something I can't seem to be able to master no matter how hard I try. Perhaps this book will have some tips for this German-blooded girl who can't make her own sauerkraut? Sauerkraut - i've tried twice with no success! Thanks for the giveaway!! I would like to be able to make a really flavorful vegetable stock and sandwich bread. Thanks! Crackers are the one item on my 'homemade pantry' to-do list I'm always hesitant to tackle. Alongside them, perhaps a variety of condiments: mustard, ketchup, mayonnaise for sure. This sounds like a great book! Tomato Paste. I want to get away from all tomato products in a can. But we LOVE tomatoes in my house. We have seedlings started for Roma and San Marzano tomatoes. How do I turn some of them into tomato paste? I would love to know how to make mustard. It feels like we always run out of it at the worst time. For me, it's a toss-up between bread and yogurt. We eat both, but although I haven't tried making yogurt yet, but I'd also like to improve my bread making skills. Being blessed with Scandinavian heritage (Danish grandpa/Norwegian grandma), a sweet tooth just naturally accompanies me around our humble homestead on a daily basis. But it’s not just any ole sweet tooth...it’s pastry cravings! I can forego the dark chocolate or cookies, etc, but when the sweet tooth craving rolls over me, making pastry is the only “goods” that will satisfy. Like you, Ashley, I have more than one pantry staple to conquer, but the two that elude me (and these are the ones for which I usually drool!) are a bear claw and a maple-glazed Long John (maple bar). My grandma didn’t have recipes for these to share and my attempts at making either have been unsuccessful in both flavor and texture. What’s a girl to do?! I’m hoping Alana Chernilla can work her culinary magic and provide a solution. Ashley, thanks for the opportunity to participate in The Homemade Pantry giveaway. Ketchup! I tried this fall and it was terrible. There are no words to tell you what a failure it was. So I guess I need more guidance. Bread...I have tried several but they just don't pass the kids test. ugh. Jams would be another! Biscuit/pancake "mix". It's so damn expensive. sandwich bread! cheese! yogurt! granola bars! i've tried all with varied success, but would love good reliable recipes that pass the kid test. This book sounds right up my alley. Thanks! looks lovely! i've seen a number of references to this book, and i can't wait to try out the recipes! tomato paste. i don't know why i can't get it quite right, it's just never the right consistency or gets slightly burned. this book looks awesome! Definitely a really good mustard! This book looks wonderful. I think it is time to face my fear of canning. This book looks terrific!! Right now I'm trying to find the perfect snack bar so I can stop buying Clif bars. Next will be tackling mustard and the list of things goes on. I really need to figure out some homemade cheeses ! Thanks for an awesome looking giveaway ! I would love to make homemade graham crackers and marshmallows (and probably everything else in her book)--yum! Thanks for introducing me to Alana and for a great giveaway. Would love, love, love this book! I would love to make my own hot sauce and can it. We seem to go through hot sauce like its liquid gold in my house. I would have to say bread and pasta. I would also love to make my own cheese. Love, love your blog too! For me, being from india it would have to be my grandmothers mixed vegetable pickle. Not at all what Americans think of as pickle. Yummmm! This sounds great! I would like to replace mustard. I've tried and have had mixed results. So many other items too though. I would love to try it all! The crackers and snack sections look very interesting and the cover looks so yummy! This is exciting! I've been making all of our bread since New Year would love to add some home made condiments to our pantry. Love your blog first of all, just stumbled upon it a few days ago. I would love to learn to make a healthy whole wheat bread that doesn't taste like cardboard and a few of the condiments we use on a regular basis such as ketchup & mayo.Thanks for the contest. I've already got a lot of things like bread, granola, granola bars and yogurt covered. I would love to try cheese, ketchup, and spice mixes, though! Thanks! Greetings from Canada! I've always wanted to tackle sauerkraut, being as we are surrounded by Ukranian/Polish settlers here in own area. My kitchen "bucket list" also extends to everything from making cheese to "hide the recipe, oh so good" SALSA! Would absolutely love a copy of this eye pleasing book! Ah! This book is just what I've been looking for! I've always wanted to make cheese, yogurt, butter, and I long to master the art of sourdough bread. I'm working on the last one, but the rest I've yet to try. Thanks for the great giveaway! This book looks wonderful! In the past year or so, we have been trying to make as much of our own food as we can, and this book looks like it would definitely be a great helper. Yogurt and bread are at the top of my list. Looks like a great book, thanks for the giveaway!